Monday 4 August 2014 was the one hundredth anniversary of Britain’s entry into the First World War. At least one million British and Empire service personnel were killed in the four years that followed along with tens of thousands of British civilians. Across Europe and, indeed the world, the number who died runs into many millions – a total that is impossible to calculate accurately. A single white lily will be placed alongside the memorial by the Churches Conservation Trust as a mark of respect. You can find out more about our Two Churches. There was a massive effort on the home front also – in mines and factories and notably in Lincolnshire on the land – where food production ensured that Britain was able to beat the German blockade. If you have any records, reminiscences and photographs of any of your family (whether military or civilian) during World War One, you might like to make them available for posting on the website. You can either scan and email them to cat@alvinghamvillage.co.uk or bring them to Cat in Shaw's Shop and she will scan them for you. 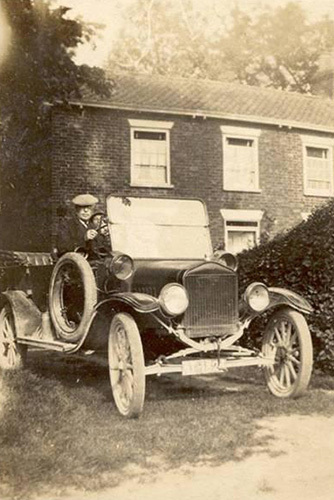 This is Mr John Wright at “The Elms” in his Ford Model T known as the Tin Lizzie. We always love hearing from families researching family trees and we try to do our best to put everyone in touch with descendants of families to help with queries.